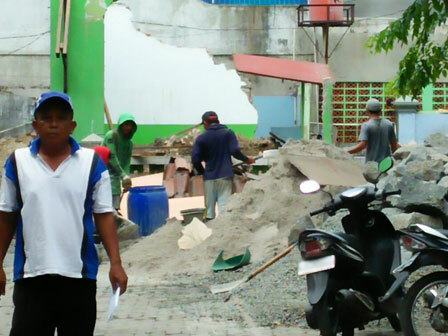 Fire station construction is started to be built in Koja Sub-district office yard, North Jakarta. It is estimated to complet within two months. "It is a densely populated area in here "
Koja Sub-district Secretary, Sarpu said, fire station will be located at mushala land, the office's north side. Fire station is needed to be built because the environment is included as densely populated area and prone to fire. "Mushala will be built on the upper floor, while fire station on the ground floor. It is a densely populated area in here, thus we need to anticipate fire," he said, Wednesday (10/18). According to him, on 60 square meters land, fire station and mushala will be constructed using donation from local residents, employees, and corporate social responsibility program. Currently, there are two fire stations in Koja Sub-district; Permai Fire Station which located between North Jakarta Mapolres and Jakarta islamic Center and in the near future fire station will be built at former Transmigration Office on Jalan Plumpang Raya area.